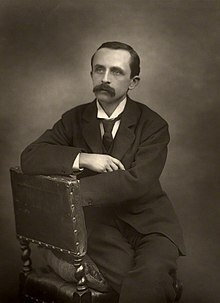 Sir James Matthew Barrie, 1st Baronet, OM (9 May 1860 - 19 June 1937) was a Scottish writer. His best-known work is Peter Pan. Barrie was born in Kirriemuir. He died of pneumonia in London. This page was last changed on 26 August 2016, at 11:50.